In years past I’d be all about heading down to UCSD for the Triton Invitational water polo tournament over the long weekend, but this year…meh. The tournament that in 2006 included fourteen teams and 29 separate games will only host six teams playing a total of ten games this weekend. None of the other UCs will be there, and with Cal coming down separately next month I’m just not seeing the attraction this year. The fact that the tournament no longer includes bracket play leading to a spectacular final, but rather a pre-ordained final game between Air Force and La Verne doesn’t help. Nothing against Air Force. Nothing at all. I’d just like a little suspense and drama with my beefcake. So instead we might head up to Disney, or enjoy the San Clemente Village Farmer’s Market (emphasis on the local artists) on Sunday morning. Or just paint a bathroom and run some wiring. Or sit on the coach and watch Red State on VOD. Or just do nothing at all. Except for a run to the gym and the bank, it looks like Friday will be spent chained to the desk coding the Great Unbillable Project, the website that gives me karma instead of cash. After work though, going to try and get down to La Jolla and watch UCSD and Long Beach State play a little water polo. Cuz, ya know, that’s a good way to start the weekend. This will be the first game of the season for us since we skipped the Triton Invitational last month. Besides, at the rate California and the UC budgets are going, we can’t really count on these things being around forever, so we better catch local match ups when we can. Yes, I’m being pessimistic, but it’s getting harder and harder to be anything but. Normally by this time of the year I’d be looking forward to the Triton Invitational Water Polo tournament at UC San Diego. Four years ago 14 teams participated. Three years ago the tournament was down to a field of eight teams. At one point there were five UC teams participating from what were then nine campuses. Even with Cal (Berkeley) itself never making the journey, it was always great as an alum and most-of-my-life Californian to be able to see water polo teams from five of the nine campuses competing against each other in some quality match-ups. Just finally saw this year’s schedule this morning:this year’s tournament is down to five teams, with the host being the only UC present. No brackets, just each team playing every other team once. I’m sure there will be some quality games, but the trends are difficult to ignore. Hard to not see it as just another step on the UC’s ongoing Drive to Mediocrity. Chuck posted this on Friday, August 13, 2010 at 10:54 am. Comments Off on Indicators? Cal water polo took three out of four games at the tournament I should have gone to see in Irvine, coming in second to U$¢. Cal professor Oliver Williamson was one of two Americans to take the annual Nobel prize for economics this weekend. UC management is now reportedly looking at major-by-major surcharges for different undergraduate programs. Wanted to go up to Irvine this weekend to catch #4 Cal water polo in action, but alas, it is not to be. C’est la vie. Going to have to let my alumni spirit be pumped by last night’s high school outreach session. These college fairs are always fun events, with the alums working the table to talk to high school students about Cal, what it means to be a Bear, and why Cal is Cal and not just another UC[FillInTheBlank]. There were three of us at it last night: an attorney, a banker and a Marine officer with graduation years from 1984 to 2001, and it was a blast. As always, there were just enough kids that had the right attitude and class that I can really hope to be seeing them at alumni events in six years or so. There were a lot of others too, mostly being towed around by their parents, but I’m just tuning them out. Looking for leaders and hope, not more sheep. Need more positive thinking and hope for the future. California, and Cal, have huge problems facing them. Years and years of chronic mismanagement have led to a state so gridlocked that it can’t keep office doors open for forty-hour workweeks and courts have to take furlough days to keep their budget balanced (and it’s not like they were providing timely services in the first place). Really having a lot of doubts about the future of this state, and not yet seeing a light at the end of the tunnel. Maybe one of these kids will have the answer. Unfortunately I think they’ll have a shot at solving the problem. I don’t see the current officials in Sacramento (or the self-proclaimed outsiders positioning for office) having the answers, and certainly don’t see anyone paying down the massive public debts before these kids graduate and enter the work force. Sorry this is turning so serious. Maybe I should’ve been irresponsible and headed up to Irvine anyways. Fiscal extravagance is the California way. Then I could be sitting back in the bleachers saying ‘oh, that’s pretty‘ and watched Cal dominate the way Bears should. It’s been a long week. I’m ready for the weekend. Big thoughts are just depressing me, so, to paraphrase Buffy “fire pretty.” If I remember right she meant fire literally, but I’m just thinking of the hotness and the glistening light. Finally getting caught up on some projects now that the lack of Cipro in my bloodstream is letting me focus for more than ten minutes at a stretch. Not just work, but the household stuff like getting Diego in for a very overdue haircut this afternoon. But that return to focus is starting to drift again as I look forward to this weekend’s annual Triton Invitational. 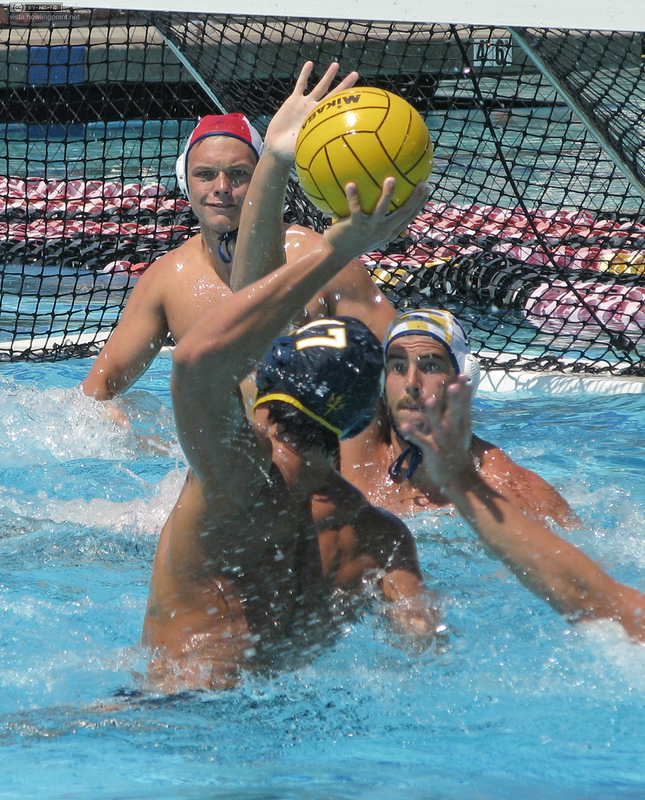 Eight teams playing 16 games of water polo over the Labor Day weekend down the road at UCSD. I’ve posted here before (here, here and here) about the unfortunate decision by UC Santa Cruz to end their water polo program. More and more I’m convinced the UC is just nickle and diming itself to mediocrity. Interesting then to see an interview this morning with Alan Cima, a coach who’s been involved with the men’s and women’s program there for the last nine years. Good perspective on the UCSC rationale (or lack thereof) for the cuts, and I was grateful to learn that Cal and UCLA were “worried” about the situation. This kind of precedent at one campus cannot be good for any of the UC programs. I’ve lamented here in the past about the UC’s drive toward mediocrity, particularly as shown by the axing of the Santa Cruz water polo program. Though I still think the UC can and should do better in protecting the system’s reputation and standing in all programs, I read an interesting article yesterday that included some discussion of Yale’s water polo program, and other sports, after they lost official recognition and became club programs. Glad to see that relegation to club status isn’t always the death knell of an athletic program, but can lead to positive outcomes. Two related notes for the aquatics inclined: Penn State swimmers raised $235 in a charity auction by agreeing to deliver pizza in their speedos, and this year’s Maverick’s Big Wave contest may be canceled due to a lack of sponsors. Hmmm. Pondering. Hmmm. Chuck posted this on Thursday, December 4, 2008 at 9:37 am. 6 comments have been made. Join them. Big Game week is upon us. The only football game that really matters, ever, will start in a few minutes when Cal and Stanford meet for the 111th Big Game at Memorial Stadium in Berkeley. We did Big Game dinner with the local alums at The Linkery on Thursday, and though Spinner had met the alums before the look on his face when it came time to perform the various drinking songs was priceless. Seeing the local matriarchs who probably graduated well before The War doing their Grrrahs (complete with bear clawing motion) was a little too much for him. Even with all that though, I won’t pretend to be much of a football fan – just a Cal fan who tolerates football as a means to financially to get us through to the sports where we win. Want the better views of the blue and gold? At least rugby, water polo, rowing and swimming are all considerate enough to visit those of us in extreme southern California. Chuck posted this on Saturday, November 22, 2008 at 1:46 pm. 3 comments have been made. Join them.